The Woodchopper’s Ball is held weekly, every Tuesday, at the beautiful historic Verdi Club, the hall for an Italian American social club since 1935. 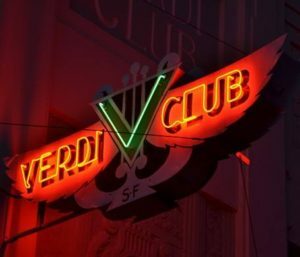 The Verdi Club features a swanky, newly renovated lounge with a full bar, and a 2,500 square-foot dance floor ballroom. Come swing dance and enjoy a classic cocktail in this spacious and uniquely vintage atmosphere! 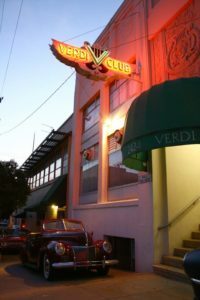 There is limited street parking near and around the Verdi Club. However, due to a recent history of break-ins on Hampshire St. between 17th St. and Mariposa St., we strongly suggest you avoid parking on that block. Instead, we recommend parking on better-lit and more heavily traveled streets such as Potrero Ave., Mariposa St., and other nearby streets. And as always, to discourage break-ins, do not leave valuables or any other items (visible or not) in your unattended vehicles. Easy access to public transportation. Close to MUNI bus routes 9, 22, 27, 33, 90, and the 16th St. Mission BART station.